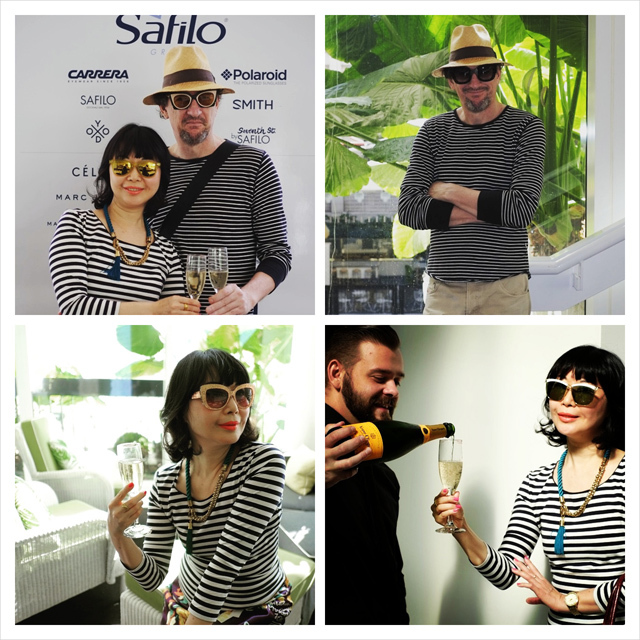 Safilo Australia could not have picked a better day for their S/S 2015 Eyewear Collections Media Showing. Not only was the 5th of May a blue sky sunny day, the temperature even reached 27C, which was quite unusual for May. The sun-filled Ivy Sun Room was the perfect venue for the media launch of these leading labels’ latest sunnies. ‘Another day in the office?!! !’ I said to Melanie while receiving a glass of Veuve Clicquot. Kent and I were excited to be in this spacious sun room full of luxury eyewear from fashion’s leading brands, and we were just about to discover their latest trends. As Safilo Group is licensed to produce eyewear for many of the high-end fashion labels, such as: Alexander McQueen; Bottega Veneta; Boss; Dior; Emporio Armani; Fendi; Giorgio Armani; Gucci; Jimmy Choo; Kate Spade; Marc Jacobs and Max Mara… just to name a few. Melanie gave us a detailed tour, as I’d like to call it, which means she spent a generous amount of time on each label and introduced the new trends in the coming season to us. After this informative walk around with Melanie, we started trying on some of the shades we adored. (Wouldn’t you do the same thing too?!) From what I had seen, 50’s-60’s cat eye trend and ‘The Last Emperor’ (nick named by moi!) rounded frames seemed like the popular styles in the coming season! Here’s my favourite pair from the viewing, which was a Fendi creation (see the main picture above). I spotted this pair as soon as we walked in. I’ll let Kent’s photograph do the talking. I’d also like to include some more photos from my Instagram. You can see that we were having fun trying on different pair of sunnies below. 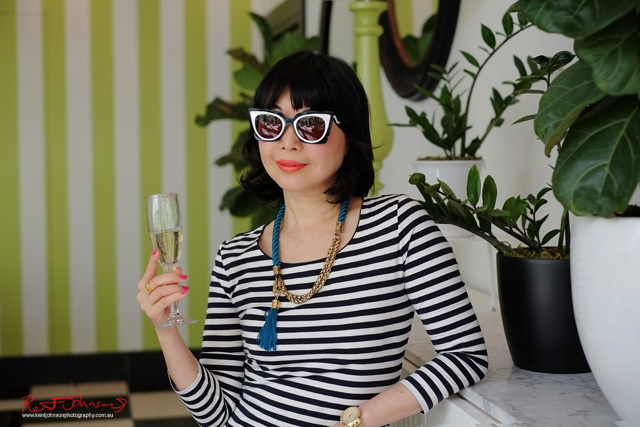 ‘I love Ivy Sun Room, maybe we can try the fabulous shades in Ivy Pool Club next time?!! !’ I jokingly said to Melanie before we left. For more images and stories, please check out Kent’s Street Fashion Sydney blog! Love the sunnies, but I am obsessed with that tassle necklace! Those sunglasses match your stripes shirt perfectly! So cool! You couldn’t have chosen a better pair! I can see why this was your favorite pair, I am so loving it on you. You look great. Fantastic sunglasses and your necklace is divine!!! That’s why we need to try them on to see if they suit our face shape.., and in my opinion, even matching/enhance our aura. Trending or not is a different matter! Wow! This event sounds fantastic and what a pretty picture of you! Great sunnies! I’m glad that you noticed it! 😀 Actually; I picked this stripe background to do the shoot on purpose! As the wall paper is not horizontal stripes; that makes the picture more interesting! You look really cool with that fitted outfit to fit with your cool sunglasses! 😉 Lovely cool! Way back when I was 9 years old, I started location scouting after school. I'd organise anyone I knew; from family members to school friends to collaborate on self-styled self portraits with me. I became a published author in my early 20's in Taiwan, but that didn't mean I stopped making my self portraits. I guess I took it to the next level by getting photographers to shoot my self-styled portrait - at the locations I chose. I wrote for young adults, the main publishers I worked for were Morning Star Publishing Inc. and The Theater Publisher Inc. I was also a guest writer and travel journalist for Taiwan's Travel Trend Magazine. Moving back to Sydney in year 2000, I worked as a translator including translated British author Anna Maxted's 'How To Seduce Your Dream Man' ( by Harper Collins Publishers Ltd. )from English to Chinese. My Chinese translation was published by Morning Star Publishing Inc. in 2002. Before I discovered the blog, I could not imagine combining ALL my passions on one platform: self-styling; self portrait; location shoot and writing stories. I have finally found a stage for them all! No matter if I'm writing for one reader or one hundred readers; my dream is fulfilled. Right here, right now! White Caviar Life is an accommodation focused travel, fashion and lifestyle blog.